The biological causes of childhood obesity are complex. Environmental factors, such as massive marketing campaigns for food leading to over-nutrition and snacking and the decline in physical activity, have undoubtedly contributed to the increased prevalence of overweight and obesity in children, but these cannot be considered as the only causes. Susceptibility to obesity is also determined to a great extent by genetic factors. Furthermore, molecular mechanisms involved in the regulation of gene expression, such as epigenetic mechanisms, can increase the risk of developing early-onset obesity. There is evidence that early-onset obesity is a heritable disorder, and a range of genetic factors have recently been shown to cause monogenic, syndromic and polygenic forms of obesity, in some cases interacting with environmental exposures. Modifications of the transcriptome can lead to increased adiposity, and the gut microbiome has recently been shown to be key to the genesis of obesity. These new genomic discoveries complement previous knowledge on the development of early-onset obesity and provide new perspectives for research on the complex molecular and physiological mechanisms involved in this disease. Personalized preventive strategies and genomic medicine may become possible in the near future. Childhood obesity is one of the most serious public health challenges of the 21st century. This global health problem is gradually affecting both developed and developing countries, particularly in urban settings. In the United States, childhood overweight and childhood obesity are defined as a body mass index (BMI; (Weight in kg)/(Height in m)2) greater than or equal to the 85th and 95th percentile for gender and age, respectively . In Europe, the European Children Obesity Group defined childhood overweight and childhood obesity as a BMI greater than or equal to 90th percentile to 97th percentile for gender and age . A reference population has been established to propose an international standard definition for childhood overweight and childhood obesity . The prevalence of overweight and obesity in childhood is increasing worldwide at an alarming rate: today, about one in three children and adolescents is overweight or obese in the United States; over the past three decades, the prevalence of obesity has tripled for children 2 to 5 years old and youths 12 to 19 years old, and has quadrupled for children 6 to 11 years old . According to the World Health Organization and to the International Obesity Task Force, more than 155 million children and adolescents worldwide are overweight and 40 million are clearly obese. Early-onset obesity is associated with an increased incidence of adult obesity , type 2 diabetes , nonalcoholic fatty liver disease  and cardiovascular risk factors . Obese children have an increased risk of developing obesity-related co-morbidities, such as orthopedic, ophthalmologic and renal complications , respiratory diseases such as obstructive sleep apnea , and psychosocial impairment . Obesity-associated complications are now believed to be leading, for the first time in modern history, to a decrease in life expectancy of 2 to 5 years for the US generation that is currently young . Today, medical and behavioral interventions as treatment for obesity in childhood remain scarce and largely ineffective. There are currently three main treatment modalities for obesity: lifestyle modifications, pharmacotherapy and bariatric surgery. The cornerstone of lifestyle modifications includes changes to dietary and exercise habits . However, less than 5% of the obese people who follow these recommendations effectively lose weight and maintain that weight loss . The long-term safety and efficacy of the anti-obesity drugs (orlistat and sibutramine) have not been determined in children or adolescents, mainly because pharmacotherapy is not routinely proposed as a treatment for childhood obesity . Bariatric surgery is a new treatment for morbid obesity in children but the relevance of an invasive surgery procedure in childhood or adolescence is still under debate . A recent study  reported the first case of laparoscopic sleeve gastrectomy successfully performed in a 6-year-old morbidly obese child. Because of the lack of efficiency of the current approaches to reverse childhood obesity, prevention was proposed as the first line of treatment in 2003 by the American Academy of Pediatrics . In its policy statement, the Academy promoted breastfeeding, healthy eating habits and physical activity and encouraged limitation of television viewing. However, current prevention programs have had little success and have proven ineffective in reversing the rising rates of childhood obesity . These disappointing observations reveal the urgent need to better understand the complex molecular and physiologic mechanisms involved in human obesity in order to propose better disease prevention and care. The epidemic of obesity is attributed to recent environmental changes. Easy access to high-energy palatable food, combined with decreased physical activity levels, have undoubtedly had a major role in the global increase in the prevalence of early-onset obesity . Beyond 'the big two', other putative environmental contributors to the recent obesity epidemic have been proposed, such as an obesity-prone intrauterine environment, assortative mating among obese individuals, decreasing sleep duration, infections and low-grade inflammation or the increasingly controlled ambient temperature . However, if these factors are responsible for the global shift in BMI distribution, genetic factors must explain most of the inter-individual differences in obesity risk observed in populations (in other words, where each individual sits on the BMI distribution) . In fact, the risk of obesity in a child is ten times higher if both parents are obese than if both parents are of normal weight . Heritability represents the proportion of phenotypic variation in a population that is attributable to genetic variation among individuals. According to twin and family studies, heritability estimates for BMI during childhood or adolescence are between 0.20 and 0.86 [22, 24–29]. Longitudinal studies have demonstrated that heritability estimates tend to increase from childhood to pre-adolescence [26, 29] and from pre-adolescence to adolescence , probably because individuals at genetic risk for obesity increasingly select 'obesogenic' environments (environments that promote gaining weight) correlated with their genetic propensities. In addition, physical activity reduces the influence of genetic factors on BMI in young adults, and it is likely that these results are transposable to children or adolescents . Even if heritability estimations of BMI are similar in boys and girls, some sets of genes explaining the BMI variation may, at least in part, be different in males and females . The values of heritability for BMI in childhood remain high even in the obesogenic environment currently present in developed countries such as the US [22, 28]. Several single-gene disorders result in severe, early-onset obesity. These monogenic forms of early-onset obesity show the biological importance of the mutant gene in body-weight control. The main genes affected in these monogenic disorders (leptin (LEP), leptin receptor (LEPR), pro-opiomelanocortin (POMC), prohormone convertase 1 (PCSK1), melanocortin 4 receptor (MC4R), brain-derived neurotrophic factor (BDNF) and neurotrophic tyrosine kinase receptor type 2 (NTRK2)) encode hormones or neurotransmitters and their hypothalamic receptors of the highly conserved leptin-melanocortin pathway, which is critical for the regulation of food intake and body weight . A case of Single-minded homolog 1 (SIM1) haploinsufficiency has been reported in one patient with early-onset obesity . The SIM1 gene encodes a transcription factor essential for formation of the supraoptic and paraventricular (PVN) nuclei of the hypothalamus. Additional evidence of a role of SIM1 haploinsufficiency in human obesity was provided by the finding of rare non-synonymous SIM1 mutations enriched in severely obese patients in comparison with lean individuals . Recent data have linked SIM1 haploinsufficiency with Mendelian obesity and a Prader-Willi-like syndrome (F Stutzmann et al., personal communication). The loss of function C256Y mutation in the wingless-type MMTV integration site family, member 10B (WNT10B) gene, which encodes a signaling protein that negatively regulates adipocyte differentiation as part of the Wnt signaling pathway, was shown to co-segregate with overweight or obesity in one pedigree, but further studies are needed to confirm the link between this gene and monogenic early-onset obesity . The majority of genes involved in monogenic forms of early-onset obesity were identified as candidate genes on the basis of previous evidence from physiological studies and animal models. Children with a strong family history of obesity and issued from consanguineous families are of particular interest for genetic diagnosis of early-onset obesity. Monogenic obesity forms are frequently accompanied by additional clinical features (for example, severe hyperphagia, intestinal troubles) and normal development, except for BDNF, SIM1 and NTRK2 deficiencies, which are associated with cognitive impairment, behavioral problems or syndromic features [35, 36]. The focus on the leptin-melanocortin pathway as a target for pharmacological intervention in patients with severe obesity turned out to be effective. The best illustration is certainly the case of a child with congenital leptin deficiency who was treated with subcutaneous injections of recombinant human leptin, leading to the correction of all the phenotypic abnormalities seen in this patient . Complex obesity syndromes are defined as Mendelian disorders with obesity as a clinical feature that are also associated with mental retardation, dysmorphic features and organ-specific developmental abnormalities. Over 30 syndromes that include obesity have been identified but only some of them, such as the WAGR (Wilm's tumor, aniridia, genitourinary anomalies and mental retardation) , Prader-Willi , Bardet-Biedl , Alström  and Cohen  syndromes, have been associated with early-onset obesity. The genetic basis for these syndromic forms of early-onset obesity has been elucidated, revealing an important genetic heterogeneity. Molecular genetic analyses of individuals with WAGR syndrome have revealed that the Wilm's tumor 1 (WT1) and Paired box 6 (PAX6) genes are involved with this syndrome, but deletions in the BDNF gene were recently shown to explain the phenotype of obesity found in a subgroup of patients with the WAGR syndrome . Prader-Willi syndrome (PWS) can have several etiologies but it is always associated with loss of expression of paternally transmitted genes on 15q11-13. A microdeletion of the HBII-85 small nucleolar RNAs (snoRNAs) caused the PWS phenotype in a child  and recently another de novo microdeletion at chromosome 15q11-13 that encompasses non-coding snoRNAs was identified in a patient affected with hyperphagia, early-onset obesity, hypogonadism and mild learning difficulties but diagnosed negative for PWS . Bardet-Biedl syndrome (BBS) has extensive genetic heterogeneity and so far 14 genes have been associated with it . The BBS proteins are implicated in the function of primary cilia and intraflagellar transport . Finally, Alström and Cohen syndromes [41, 42] are associated with childhood truncal obesity and have a unique genetic cause. For Alström syndrome, children usually have normal birth weight but become obese during their first year, resulting in childhood truncal obesity . ALMS1, the only gene currently known to be associated with Alström syndrome , codes for a protein involved in the normal functioning of primary cilia. The only gene so far involved in Cohen syndrome is COH1, which encodes a transmembrane protein of unknown function . Genome-wide linkage scans involve the genotyping of families using highly polymorphic markers that are positioned across the whole genome, followed by a calculation of the degree of linkage of the marker to a disease trait. Genome-wide linkage approaches led to the successful identification of numerous genes involved in Mendelian human diseases, but their relevance in the identification of genes contributing to complex diseases has been more controversial . More than 60 linkage studies for obesity-related traits were published in the 2006 update of the Obesity Map , but only three studies involved pedigrees with children or adolescents [48–50]. The only significant evidence of linkage for childhood obesity was obtained on chromosome 6q22.31-q23.2 in 115 French pedigrees . Subsequent positional cloning led to the identification of a three-allele risk haplotype (K121Q, IVS20delT-11, A→G +1044TGA; abbreviated to QdelTG) in the ectonucleotide pyrophosphatase/phosphodiesterase 1 (ENPP1) gene that showed association with childhood obesity and contributed in part to the observed linkage of chromosome 6q with childhood obesity . The haplotype was associated with increased serum levels of soluble ENPP1 protein in children. The function of the gene can be directly related to obesity: ENPP1 inhibits insulin receptor activity , and up- or downregulation of ENPP1 expression in liver is associated with decreased or enhanced insulin sensitivity, respectively, in rodents [53, 54]. Insulin resistance in children is a strong predictor of future weight gain [55, 56]. The association of the ENPP1 risk haplotype with childhood obesity has so far been replicated in only one (Bottcher et al.) of two studies [57, 58], and further replication studies followed by a large meta-analysis are needed to provide an unequivocal confirmation. As observed for other complex diseases, linkage approaches have been mostly unsuccessful in identifying new obesity genes. Statistical simulations predict that odds ratios (ORs) must be high (more than 2) to induce significant peaks of linkage in modest family sample sets, making genome-wide linkage scans more relevant to identifying gene variants with high ORs . Candidate gene approaches have been performed for hundreds of genes, and genetic variations in at least 127 candidates have been associated with obesity in at least one study according to the 2006 update of the Human Obesity Map . However, the risk of reporting a false positive result is extremely high in single underpowered studies as a result of the 'winner's curse' effect (the 'winner's curse' effect leads to an over-representation of genetic studies with positive results in the literature), and only three genes have reached a convincing level of association with childhood and adult obesity using meta-analytic strategies. Two coding non-synonymous gain-of-function polymorphisms (V103I and I251L) in MC4R have been reproducibly associated with protection from obesity onset in both children and adults. A meta-analysis of 15 independent studies was performed for the I251L polymorphism (OR = 0.38 to 0.71, P = 3 × 10-5), and 37 independent studies were collected for the study of the V103I polymorphism (OR = 0.71 to 0.88, P < 0.0001) [60, 61]. More recently, the non-synonymous variants N221 D and the Q665E-S690T cluster in the PCSK1 gene were consistently associated with obesity in adults and children in eight independent case-control or family-based cohorts of European ancestry (Poverall = 7 × 10-8 and Poverall = 2 × 10-12, respectively) . Functional analysis showed a 10.4% reduction of the N221D-mutant PC1/3 protein catalytic activity . The association of the N221 D variant with BMI and obesity was confirmed in two large adult European populations [63, 64]. MC4R and PCSK1 can be considered as relevant candidate genes for polygenic studies because these two genes contribute to monogenic forms of early-onset obesity [65–67]. As the endocannabinoid receptor 1 (CNR1) is the target of the anti-obesity drug Accomplia, a candidate gene approach was performed with the CNR1 gene and led to the identification of two intronic polymorphisms (rs806381 and rs2023239) that were consistently associated with BMI level and childhood or adult obesity risk in a meta-analysis of 5,750 people . Five independent studies in adults confirmed the potential role of polymorphisms at the CNR1 locus in body-weight control [69–73]. The dramatic progress in the human genome single nucleotide polymorphism (SNP) map through the International HapMap Consortium , combined with the development of new methods for high-throughput genotyping using SNP microarrays, have made comprehensive genome-wide association studies (GWASs) possible . In the past 3 years, genome-wide association studies have led to the identification of more than 250 genetic loci that are reproducibly associated with complex disease-related traits , including several loci associated with obesity risk and BMI variation . The first GWAS for early-onset obesity was published in 2007 . DNA array information was available for 487 extremely obese young German people and 442 healthy lean German controls, and replication studies were performed with 644 independent families with at least one offspring and both parents obese . This modestly powered but pioneering study identified variation in the Fat mass and obesity associated (FTO) gene as consistently associated with early-onset obesity and confirmed FTO as a major contributor to polygenic obesity - FTO had previously been linked by GWAS or population structure approaches to type 2 diabetes and obesity susceptibility [79–81]. In 2009, a GWAS was published for early-onset and morbid adult obesity in a French population. DNA arrays were genotyped in 685 obese children, 695 morbidly obese adults (obese patients were from families with a high recurrence of obesity), 685 lean children and 731 lean adults. The best association signals were further investigated in 14,186 European adults or children . This study independently confirmed at the genome-wide level of significance the association of variants in FTO and near MC4R with obesity risk and BMI variation (Poverall for obesity risk and BMI variation = 1 × 10-28 and 5 × 10-15, respectively). The association signal near MC4R has been previously identified in a GWAS meta-analysis for BMI in European adults  and in a GWAS for waist circumference in Asian Indians . Three new obesity-predisposing loci (Niemann-Pick disease, type C1 (NPC1), the transcription factor c-MAF (MAF) and phosphotriesterase-related (PTER)) were identified at the genome-wide level of significance in the whole sample . Very recently, a joint analysis of GWAS for early-onset extreme obesity in French and German study groups identified gene variants in or near FTO, MC4R, transmembrane protein 18 (TMEM18), serologically defined colon cancer antigen 8 (SDCCAG8) and TRF1-interacting ankyrin-related ADP-ribose polymerase/methionine sulfoxide reductase A (the TNKS/MSRA gene cluster) . The TMEM18 locus was previously identified as associated with adult BMI in the international GIANT consortium , and the TNKS/MSRA gene cluster had previously been linked to waist circumference in adults . Interestingly, some of the new loci associated with BMI in adults and identified by GWAS approaches [64, 80, 83, 87] have also been associated with childhood extreme obesity (TMEM18, Glucosamine-6-phosphate deaminase 2 (GNPDA2) and Neuronal growth regulator 1 (NEGR1)) or BMI in children (Insulin induced gene 2 (INSIG2), FTO, MC4R, TMEM18, GNPDA2, NEGR1, BDNF, and Potassium channel tetramerization domain containing 15 (KCTD15)) [64, 88]. Several of the likely causal obesity-predisposing genes are highly expressed or known to act in the central nervous system, emphasizing, as with Mendelian forms of obesity, a key role for central regulation of food intake in predisposition to obesity . Humans are usually diploid and they have two copies of each autosomal region, one per chromosome. This may differ for particular genetic regions as a result of structural variation, such as copy number variation (CNV), which includes deletion, duplication, translocation and inversion of chromosomes. CNVs are either inherited or caused by de novo mutation. It has recently been suggested that common CNVs could explain a substantial part of heritability in complex diseases . A common 45-kb deletion upstream of the NEGR1 gene tagged by the polymorphism rs2815752 has been identified as associated with BMI variation in adults by a GWAS approach . This deletion was consistently associated with BMI variation and risk for extreme obesity in children [64, 88]. Two reports have recently highlighted the contribution of rare CNVs to the genetic architecture of early-onset obesity [90, 91]. A recent study including 300 Caucasians with severe early-onset obesity (143 of whom also had developmental delay) and 7,366 controls showed that large, rare chromosomal deletions (located on chromosomes 3, 6, 8, 10, 11, 15, 16, 17 and 22) were twice as frequent in patients as in controls . A 16p11.2 deletion previously associated with autism [92, 93], schizophrenia  or mental retardation  was carried by five patients with severe early-onset obesity and developmental delays and was the commonest CNV associated with obesity . The association between deletions on chromosome 16p11.2 and obesity and developmental delays was confirmed in a second study involving more than 16,000 people . The presence of deletions at 16p11.2 led to an incomplete penetrance of obesity in childhood but to a fully penetrant phenotype of severe obesity in adulthood in this study . In the two studies [90, 91], 16p11.2 deletions arose de novo in some patients whereas they were inherited in others. The 16p11.2 deletions accounted for 0.7% of morbid obesity cases without developmental features and were the second most frequent genetic cause of obesity after point mutations in MC4R . An inverse phenotype of underweight has been observed in carriers of duplications on chromosome 16p11.2, confirming a key role of this region in body weight regulation . CNV analysis has enabled detection of chromosomal regions (including a single gene or a contiguous set of genes) associated with obesity and thus the identification of new candidate genes implicated in disease susceptibility. The 16p11.2 deletion interval identified in these studies encompasses about 30 genes. SH2B adapter protein 1 (SH2B1) is one of these genes and is an excellent candidate gene to link the 16p11.2 deletion to obesity because its encodes a Janus kinase 2 (JAK2)-interacting protein that has been recently proposed as an endogenous enhancer of leptin sensitivity . Disruption of SH2B1 in mice induces severe hyperphagia, obesity, severe insulin resistance and hyperleptinemia . Inversely, neuron-specific overexpression of SH2B1 in mice protects against the leptin resistance and obesity that are induced by a high-fat diet . In accordance with the phenotype observed in SH2B1-deficient mice, Bochukova and colleagues observed that carriers of the 16p11.2 deletion, in addition to obesity, exhibited hyperphagia and severe insulin resistance disproportionate to the degree of obesity . Several GWASs have reproducibly identified SH2B1 as a risk locus for common obesity [64, 87]. These data suggest a key role of the SH2B1 gene in the 16p11.2 deletion-related obesity phenotype, even if we cannot exclude a role for additional genes in the deleted interval. Environmental factors, such as diet, physical activity, age, gender, socio-economic status and ethnicity, among others, have been shown to modulate the risk for obesity . As obesity genetics makes further progress, considerable interest has recently been turned to the potential interactions between obesity-predisposing gene variants and specific environmental situations. A significant interaction between the effects of high-fat diet and FTO genotype on BMI has been reported recently, the observed increase in BMI across FTO genotypes being restricted to people who reported a high-fat diet . An interaction between the Apolipoprotein A-II (APOA2) -265T>C SNP and high saturated fat in relation to BMI and obesity has been observed in three independent populations . This SNP was not identified by recent GWAS approaches, suggesting that some associations restricted to specific environments can be missed in analyses that do not take into account the modifying effect of environmental co-variables. An interaction between the FTO obesity risk genotype and physical activity on BMI variation or obesity risk has been consistently reported in nine independent studies including adults and adolescents [99, 101–108]. These results strongly suggest that the increased risk of obesity provided by FTO variants can be attenuated through physical activity. Age and gender can be viewed as specific environmental conditions. Age-dependent associations of gene variants have been reported: the genetic influence of obesity risk common variants in FTO was shown to become progressively stronger across lifespan [26, 109], whereas gene variation in PCSK1 had more pronounced effects on BMI level and obesity risk in young than in late adulthood . An age-dependent penetrance of MC4R pathogenic mutations on obesity has been found in multigenerational pedigrees, the effect of mutations on the obesity phenotype being amplified by the development of an 'obesogenic' environment . Females are at higher risk of developing extreme forms of obesity than males. These discrepancies could be explained, at least in part, by female-specific genetic associations or by stronger effect sizes of genetic variants in females. This was observed for the functional polymorphism R125W in the TBC1 domain family member 1 (TBC1D1) gene. The effect of this variant on severe obesity risk was restricted to females in two independent populations [111, 112]. The observed effect of MC4R pathogenic mutations on BMI was about twice as strong in females as in males in two independent populations [110, 113]. The well-established negative association between BMI and educational status was not found in MC4R loss-of function mutation carriers, although a significant relationship was seen in MC4R non-mutation carriers of the corresponding pedigrees . These results suggest that a high level of education has no protective effect on obesity risk in the presence of MC4R pathogenic mutations. Recently, the first evidence of ethnic-group-specific association with obesity has been reported. Variants in intronic regions of SIM1 were strongly associated with BMI and obesity risk (P = 4 × 10-7) in Pima Indians. The SNPs showing strongest association were genotyped in French individuals but no association with obesity was found . As linkage disequilibrium blocks (linkage disequilibrium is the non-random association between alleles at different loci) can vary according to the ethnic background, an approach involving tagging of the SIM1 locus was applied in French Europeans and excluded a major contribution of SIM1 common variants in polygenic obesity susceptibility, a result confirmed by the absence of genome-wide significant association in the SIM1 gene region in recent GWASs . Together, the studies reviewed in this section highlight the complex interplay between genetic susceptibility to obesity and the experienced environment. Differences in the adipose tissue transcriptome have been observed depending on obesity status . A 28-day very low calorie diet in obese patients induced changes in the adipose tissue transcriptome that render their expression pattern closer to the profile of lean people . A 7-day hypercaloric diet induced significant differences in the adipose tissue expression pattern in both lean and obese people. However, six genes were differently expressed in response to overfeeding only in lean people, suggesting that there is a protective mechanism at the molecular level in response to an energy surplus that is lacking in obese patients . A recent study  assessed the impact of food intake on gene expression in human peripheral blood. Leonardson and colleagues  found that gene-expression variations are strongly connected to clinical traits related to obesity, such as hip circumference, but depend on the nutritional state (fasted or fed). The response to food intake has a significant genetic component and could facilitate the dissection of the underlying causes of obesity. The composition of the diet can also modulate gene expression. High-fat versus low-fat diets have been associated with changes in the hypothalamic transcriptome of mice . Beyond the simple observation of changes in transcriptome according to disease status or diet interventions, adipose gene expression signatures may help differentiate responders from non-responders to low-fat hypocaloric diet and pave the way for future personalized nutritional approaches . Testing DNA markers for association with complex traits at the genome-wide scale is now a reality. However, more information on how variations in DNA affect complex physiological processes may come from transcriptome studies . Gene expression can be used as an intermediary phenotype for complex traits in order to refine the disease phenotype and identify pathways and genes associated with that disease phenotype . By integrating DNA variation and gene expression data in liver (an important tissue involved in metabolic diseases) with the complex trait obesity in segregating mouse populations, and by validating the best candidate genes in knock-out or transgenic mice, Eric Schadt and colleagues [123–126] identified ten causal genes involved in variation of obesity-associated traits. An integrative approach combining gene expression adipose data in humans and mice, genome-wide linkage and association mapping and a gene network approach  identified a core network module of genes involved in the inflammatory and immune response as causally associated with obesity-related traits. Although this study  did not provide further functional support for candidate obesity-susceptibility genes, the expression quantitative trait locus approach in well targeted tissues is promising and may contribute to increasing the list of causal genes involved in human obesity in the near future. The gut microbiota can be considered as an environmental factor that regulates fat storage . Significant alterations in the composition of the intestinal microbiota have been identified in obese mice, suggesting that differences in intestinal flora may explain some of the risk for obesity . The proportion of beneficial Bacteroidetes bacteria is lower in obese adult patients than in lean counterparts, and this proportion increases with weight loss induced by a low calorie diet . Whereas individuals from the same families had a closer bacterial community structure than unrelated individuals, a comparable degree of co-variation was found between adult monozygotic and dizygotic twin pairs, suggesting that the gut microbiome does not have a heritable component but is strongly influenced by the environment . A case-control study in Indian children  showed quantitative differences in intestinal Faecalibacterium prausnitzii in obese versus lean children. Another study conducted with children  found that aberrant intestinal flora enriched in Staphylococcus aureus precedes the development of overweight later in childhood and could be used as a biomarker for the early evaluation of the predisposition to obesity. A recently published human gut microbial catalog of 3.3 million non-redundant microbial genes  will help assess with greater accuracy the impact of metagenome diversity on obesity in humans. Agnostic genome-wide approaches have illuminated unexpected biological pathways and provided a useful list of new candidate genes for further exploration . However, the use of genetic information to predict individual risk of disease in clinical practice remains the 'Holy Grail' for many geneticists . Common variants recently identified by GWASs have a limited predictive value for obesity risk [136, 137]. International consortia are currently working to increase the list of validated obesity-predisposing SNPs, and sophisticated methodologies (such as machine-learning approaches) are emerging to make better use of SNP information contained in DNA arrays for disease prediction . However, it is likely that common variation will explain only a modest fraction of heritability for early-onset obesity (for example FTO, the strongest predictor of obesity, is responsible for only 1% of the total heritability) . These results re-emphasize the importance of monogenic obesity in elucidating the heritability of obesity because rare deleterious mutations in the eight well-established monogenic obesity genes (LEP, LEPR, POMC, PCSK1, MC4R, BDNF, SIM1 and NTRK2) could explain up to 10% of cases with early-onset extreme obesity. Mutations in these single genes are sufficient by themselves to cause a strong effect on phenotype. People carrying these mutations have severe hyperphagia and early-onset obesity but also some other specific features (such as a low level of circulating leptin despite severe obesity, a susceptibility to infections, intestinal dysfunction, reactive hypoglycemia, red hair and pale skin and adrenal insufficiency) that can guide gene sequencing approaches (Figure 1). Monogenic gene screening prioritization during clinical examination. 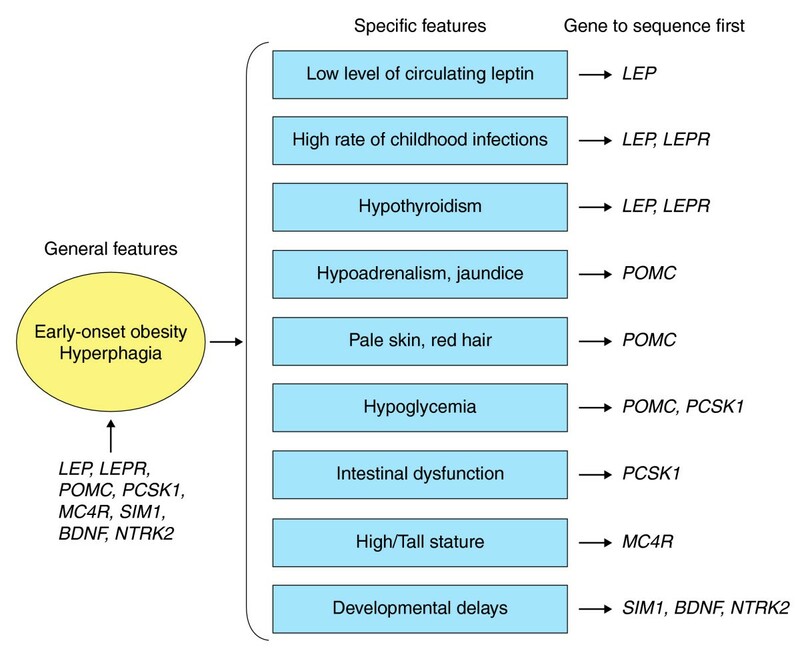 Early-onset obesity and hyperphagia are general features of monogenic obesity. Additional and more specific features can be useful to prioritize which gene should be sequenced first. Early diagnosis is fundamental for personalized prevention and effective therapeutic management. The most effective preventive strategy for these monogenic mutation carriers may be stringent restriction of food access. This will require the training and active participation of the parents. Beyond the eight currently known genes, the high occurrence of Mendelian patterns of inheritance observed in multigenerational pedigrees with extreme obesity together with the large fraction of unexplained 'missing' heritability  suggests that the causes of many monogenic cases remain to be elucidated . Several innovative strategies may soon lead to a more exhaustive picture of monogenic obesity. High-resolution homozygosity mapping in large consanguineous pedigrees is a powerful approach to discovering new obesity loci with a recessive mode of inheritance, as recently exemplified by syndromic forms of obesity . Full exome capture (an efficient strategy to selectively sequence the coding regions of the human genome) and parallel sequencing strategies in carefully selected unrelated cases and controls have proven successful for gene identification , and this approach should be successfully extended in the future to pedigrees with extreme obesity and a Mendelian pattern of inheritance. Genome-wide studies of structural variation in pedigrees or large case-control series followed by a systematic resequencing approach for genes located in genome structural variation intervals may help to identify additional Mendelian obesity genes. Apart from Mendelian forms of obesity, the use of genetic information alone will provide only limited predictive value in classifying young people at high risk for the development of childhood obesity. As summarized here, additional factors, such as environmental conditions, the transcriptome, the epigenome and the gut metagenome, can affect future obesity or response to dietary interventions. Further work is now needed to achieve a successful integration of all these sources of data to enable us to identify young people at risk for obesity and personalize preventive strategies (Figure 2) . An integrative strategy for the early identification of obesity-predisposed subjects. 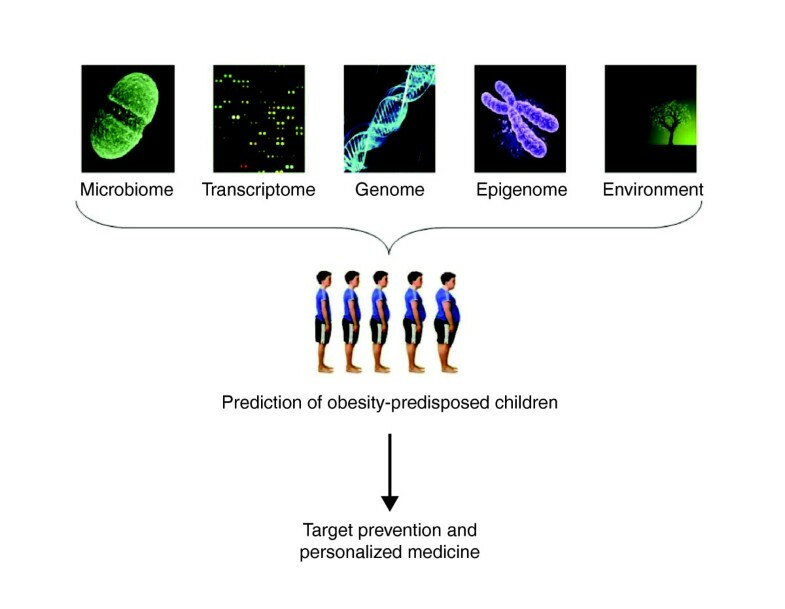 The integration of data from the gut microbiome, transcriptome, genome, epigenome and specific environmental exposures may help identify young subjects at risk of obesity, in order to apply targeted prevention and personalized medicine. Wilm's tumor, aniridia, genitourinary anomalies and mental retardation. We thank Jean-Claude Chèvre, Nabila Bouatia-Naji and Guillaume Pare for helpful comments on the manuscript.